In Guatemala, government nutrition interventions form part of a wider approach to achieving food and nutrition security that has been promoted since 2005. The current Zero Hunger Plan (PH0) 2012–16 considers the reduction of chronic malnutrition as a primary objective but also addresses acute malnutrition and seasonal hunger. PH0 is multi-sectoral and implemented through programmes operated by national institutions through the national budget; these programmes are consolidated in a single, annual operational plan and budget document prepared by the Presidential Secretariat for Food & Nutrition Security (SESAN). In Peru, nutrition interventions are based on a narrative against malnutrition that emerged in the early 2000s, which is situated in the context of poverty reduction and social development. Interventions are through budget programmes (programas presupuestales) that are multi-institutional in that they normally involve at least one national institution, regional governments and local governments. Budget programmes tend to operate within one sector, e.g., health and water & sanitation; there is no consolidation of budget programmes relevant to nutrition in a single, annual operational plan and budget. While in both countries, nutrition is firmly embedded as a priority of national interest, in Peru national legislation on decentralization and certain incentives in the context of fiscal resource allocation provide instruments for promoting the nutrition agenda at sub-national level. 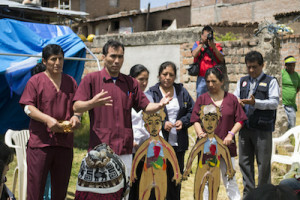 Similar instruments do not exist in Guatemala, where efforts at departmental or local level are limited to advocacy and the creation of space for multi-sectoral coordination. There are marked differences in terms of strategic and operational planning. In Guatemala, planning of food security and nutrition interventions takes place at two levels: through a strategic planning document valid for four years and through an operational plan prepared during the first months of a new government period. In Peru, there are medium-term sector or multi-sectoral plans, which in practice may overlap and do not include financial projections; thus, there is no consolidated, multi-annual plan for nutrition. Both countries have advanced Integrated Financial Management Information Systems with public access to updated budget and other management data. In both cases, the Chart of Accounts includes an adequate programme segment, which forms the basis for resource allocation and expenditure tracking at the intervention level in the context of nutrition programmes. In the case of Guatemala, expenditure tracking is consolidated in monthly reports prepared by SESAN, with data extracted from the Integrated Government Accounting System (SICOIN) managed by the Ministry of Public Finance. In the case of Peru, expenditure tracking is through a publicly available, electronic portal – Consulta Amigable – managed by the Ministry of Economy & Finance. In both countries, the role of the Ministry of Finance is key to introducing adjustments in the Integrated Financial Management Information Systems for improved budget allocation for nutrition interventions and corresponding expenditure tracking. In Peru, the Ministry of Finance has considerable leverage over key elements in programme formulation through the advancement of result-based budgeting. Also, the complex system of transfers to sub-national governments enforces the role of the Ministry of Finance in operational planning. In Guatemala, the role of the Ministry of Finance is considerably less pronounced. -Although sub-national governments may not always play a prominent role in the implementation of nutrition programmes, it seems useful to identify the extent of that role and in which sectors this activity occurs before more detailed, analytical work is undertaken. -If the budgets of sub-national governments are not fully integrated into the national budget, it is necessary to establish a methodology for capturing nutrition expenditures at sub-national level. This methodology is likely to vary from country to country. -A developed programme segment of the Chart of Accounts, and its application at budget level in the form of a programmatic structure, constitute the basis for adequate expenditure tracking. Where a programmatic structure is in the process of being developed, it would be useful to link up with this process and provide inputs that may serve the particular purpose of nutrition expenditure tracking. –Where appropriate, public expenditure on investment projects should be considered as part of expenditures on nutrition. This is particularly relevant for the water and sanitation sector. Thus, tracking should include both recurrent costs and public investments. -There is a need to strengthen the link between SUN Focal Points and the Ministries of Finance. There is also likely to be a need to train sector-based personnel (e.g., Health, Agriculture, Social Development) in basic budget issues of their country in order to improve the dialogue on nutrition expenditures. There was no differentiation between on-budget and off-budget expenditures, which is crucial since some interventions are in the national budget and therefore tracked in SICOIN (e.g. European Union budget support and those funded by the Inter-American Development Bank, the International Fund for Agricultural Development, and the World Bank). Annual expenditure figures for the projects identified were not prepared, only global figures based on funding agreements. In at least two cases, the data collection methodology was based on the preparation and circulation of a questionnaire that was sent to agencies of international cooperation and some NGOs, without the necessary follow-up through personal interviews.